PPS 870 pump shotgun Buccaneer version! plus MadMax! I got my hands on the PPS 870 Buccaneer version shotgun recently. Real wood grips and just a neat looking prop. I don't think I'd want to shoot a real one with this grip setup, but it is fun to shoot this model version! Anyway, after a few modifications, here's the result. For the video, I went full tilt with the cart loads and each one has 7x7mm MG caps. Huge sound and flash. It's tough to go through so many caps so fast, but I guess what else am I going to do with them???? Also, I found it interesting that I could fit a real Hogue pistol grip on the PPS shotguns by only changing the screw. Fit's great. So, it's kind of cool that I can change the stocks easily enough if I want to alter the look for any reason. And........just for fun I had to get the MadMax out to give it a go, too. 7x7mm caps each. You were right, huge flash and noise , I like that! Could you give us some more info on the PPS model shotgun please lj? The idea started with a desire to have a pump 870 modelgun. I know the MGC RS model is out there and I've had a couple. I've not had the old metal ones, but I have had the ABS versions. They are light and produce very little to no muzzle effects. I was not impressed and pretty disappointed. If a desirable 870 isn't available, could I make one out of an airsoft shotgun? I looked into gas airsoft shotguns available and researched the inner workings of the shell ejecting models. There are a number of them available. I learned the PPS shotgun had many desirable attributes that would make it a good base for development of an 870 modelgun. It was relatively cheap, readily available, it was mostly metal, the shells contained the gas propellant, and the inner workings were also conducive to modification to a modelgun. Basically, the shotgun itself is already a modelgun. The only thing missing is the cap-firing shells! But I had an idea for the shells already. CAW released some full brass shells for the Hudson MadMax a while ago that took up to 7x7mm caps. Because these shells were ignited by striking the "primer" and no barrel/chamber mounted detonator was needed, these seemed like a logical place to start for a platform. The PPS 870 already has a hammer strike the gas valve in its shells to fire the bbs, so the hammer strike could also easily ignite this modelgun cartridge instead. Interestingly, I was also aware of a Japanese individual who made some high quality aluminum and brass MadMax shells that were similar to these CAW carts, but looked much more realistic with a brass base and anodized red aluminum shell body. I have some basic metalworking and machining tools, so I set out to work. Measuring and modifying not only the PPS, but also the carts to work together. 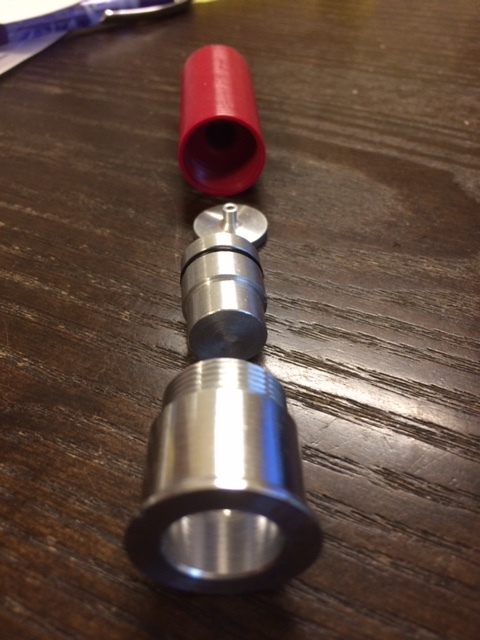 The initial prototypes involved a lot of simple mods to the gun chamber, bolt, and mag tube, in addition to machining the carts to fit the modified gun. The available carts are larger than the PPS gas airsoft shells, so mods were needed to make everything fit. Initial results were very encouraging! It works!!!!!!!!!!!!! So, after some more testing, trial and error, I decided that it would be possible to make a bespoke cartridge that could be used with zero modifications to the PPS! Imagine that!!! Get your hands on a PPS 870 airsoft shotgun and in order to "convert" it to a modelgun, ALL you need to do is use a different cartridge?!?!??!?! Would it be that easy??????????? It turns out that it IS THAT EASY! I had some custom carts created to my specifications, which are a variation of the CAW multi cap carts, and now all I need to do is load up the carts and fire away!!! No mods to the gun (unless you want to do some minor mods that help a little with effects). 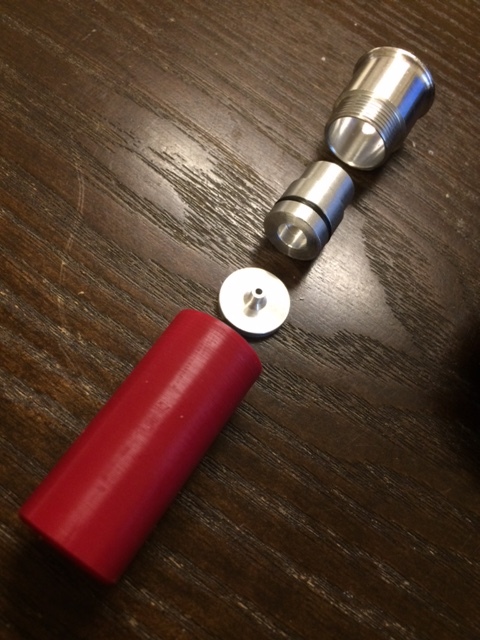 The custom carts are aluminum and Delrin. The shell body is Delrin, the cart base, primer, etc are aluminum. They are super light, easy on the model, and eject with authority because they are so light! Now one thing I learned is that the Delrin bodies sometimes can not handle a full 7x7mm load, as the internal pressure is very high. If the cap pressure is too high for the Delrin, it causes breakage at the weakest point of the body - the threaded portion. I have some powdercoated aluminum shell bodies for the times that I want to go wild and crazy with a 7x7 load. Otherwise, the Delrin seems to handle 4-5 caps without a problem and are my choice for firing usually. You'll notice an o-ring on the primer part. That was added because sometimes I would get a slam-fire with my first design, which did not include an o-ring. Adding the o-ring creates sufficient friction to keep the primer from moving during chambering which could sometimes cause self-ignition. The hammer strike easily overcomes the friction and it all works flawlessly! Well, that's a long answer to a short question! Hope that helps! Many thanks lj for your detailed response. All of your work certainly paid off well. The thought of taking a gas operated airsoft 870 and converting it to a cap firing modelgun just by changing cartridges opens up all sorts of possibilities. Brilliant and easy how often does that happen, great looking shotgun as well. Subject: Re: PPS 870 pump shotgun Buccaneer version! plus MadMax!